Marcus is about to (fingers crossed!) graduate from college. At Georgetown University, Marcus has studied history and English. Unfortunately, none of the big history firms are hiring so he's beginning a career of performing at Washington Improv Theater. 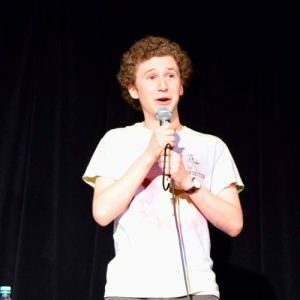 Marcus spent college improvising with the Georgetown Improv Association, performing on campus at Georgetown University, at theaters around DC, and at college comedy festivals around the country. He took classes, worked, and taught at Dojo Comedy, a fantastic little theater (and very nearby his mom’s house!). Marcus works in radio (he’s not one of those types who talks back to the radio). On his little legs, he goes long-distance running. He’s a proud member of a big Jewish family who love one another and their doggos very much. Like most everyone, it is from his family that Marcus learned the importance of stories and his particular storytelling style. He’s tweaked that style a bit from the excited, mouth-full-of-food approach but tries his best to keep to its original spirit.